Add carrots, celery, and onion; cook and stir until the onion is tender. Stir in garlic, oregano, basil and pepper. Cook for 2 minutes. Stir in lentils and tomatoes; then add the vegetable broth and water. Cover and bring to a boil. 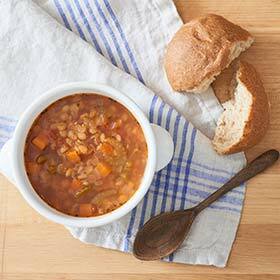 Reduce heat, and simmer for at least 1 hour or until lentils are tender. Serving size: 1 cup. Amount per serving: 151 calories, 3g total fat (0g saturated fat), 0g cholesterol, 24g carbohydrates, 9g protein, 7g total fiber, 248mg sodium.